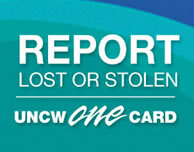 The UNCW One Card is the official form of identification on campus.Your One Card allows the use of campus facilities, and provides safe, easy access to university services and events. With your valid UNCW One Card, you can check out materials at Randall Library, access meal plans or food dollars at campus dining locations, ride the Seahawk Shuttle and WAVE transit buses FREE and much more. 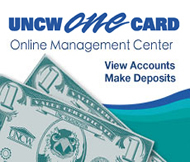 Seahawk Buck$ is the debit account feature of the UNCW One Card. With prepaid funds, you can make purchases at all food service locations, UNCW Bookstore, vending machines, student copiers, health center, pharmacy, UNCW Seahawk Mail, iPrint locations and iPrint Business Center, and more. The UNCW One Card Online Management Center gives you access to view your account balances. For more information, view our handout. You will see a number of cards list on the left. Scroll down to find the account you are looking for (i.e. Seahawk Bucks, Meal Plan, Food Dollars, Bookstore Dollars). Your Food Dollar, Seahawk Bucks or Bookstore Dollars balance will be reflected on the bottom right side of the correct card. Select the card and scroll back up to see transaction information. Your Meals balance will be reflected by clicking on the correct meal plan card listed at the bottom. Scroll back up to see available balance and transaction information. New students should submit their photo online to the UNCW One Card Online Photo Submission found in MySeaport prior to orientation. For more information on how to submit your photo online, reference our One Card Photo Submission Guide. 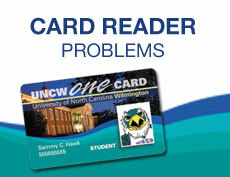 How do I get my UNCW One Card? If you are a graduate student, you need a Student ID as well. For more information go to our Graduate Student information page. All current students, faculty and staff with the old One Card (Image of Hoggard Hall on front) should come into the One Card Office at their earliest convenience to take a new photo for a new One Card. Old One Cards are no longer accepted at campus locations. All students need to have a new One Card. The $20.00 replacement card fee will be charged to your student account. If you have any questions, please contact 910-962-3560 or onecard@uncw.edu.